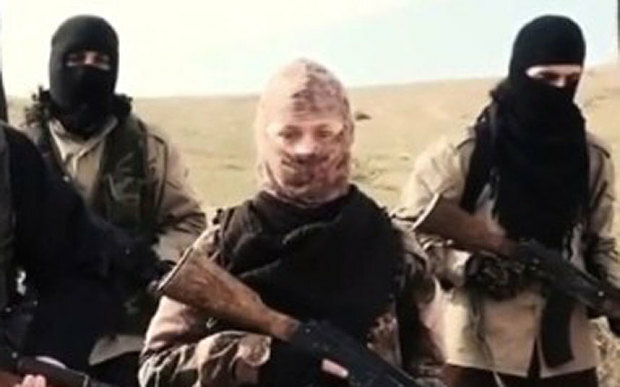 JNN 06 Feb 2015 Paris : The Islamic State has reportedly threatened France with more attacks and called for French Muslims to join the new “caliphate.” A new video by the group has emerged online, nearly a month after the deadly attacks in Paris. The video, reportedly seen by AFP, shows a masked individual surrounded by armed fighters calling on French Muslims to take up the cause for the creation of an “Islamic caliphate,” which has taken root in parts of Iraq and Syria. The group is also demanding that the French government release suspected jihadists that were detained for participating in the fighting in the Middle East. The Islamic State (IS, formerly ISIS/ISIL) Terrorists have also urged attacks on police and military targets, as well as individuals who participated in a Parisian movement last month to express outrage over the slaying of 12 people at the offices of French satirical magazine Charlie Hebdo on January 7th. Last month, Al-Qaeda in the Arabian Peninsula claimed responsibility for the massacre, which claimed the lives of 11 people, including the magazine’s top editors. Despite the attack Charlie Hebdo continued publishing. Its next edition is expected to be issued on February 25. The first post-attack edition, featuring the Prophet Mohammed shedding a tear while holding a “Je Suis Charlie” sign, was sold out within days, reaching up to 7 million copies. On January 27, spokesman and high-ranking leader of Islamic State (IS, formerly ISIS), Abu Mohamed al-Adnani, already called on Muslims to carry out attacks on “the Crusaders,” while promising to go after them in their “Christian bastions,” the recording said. The latest IS video comes less than 24 hours after another a horrific videotape was posted online showing Muath al-Kasaesbeh, a Jordanian pilot, as he was burned alive inside a steel barred cage by his captors. Meanwhile, France remains on edge following a knife attack on Tuesday against three soldiers in the French city of Nice on Tuesday. Two of the soldiers received wounds and a third was able to wrestle the assailant to the ground, AFP reported. The attacker, identified as 30-year-old Moussa Coulibaly, is said to be no relation to Amedy Coulibaly, who killed a policewoman and four Jewish customers in a kosher grocery store during the Paris attacks last month before being shot at point-blank range by police. In September, France joined the US-led coalition carrying out air strikes against IS militants in Iraq, but has declined to participate in the aerial campaign against the group in Syria, where the government of President Bashar Assad has condemned the attacks on Syrian territory. The ISIL controls some parts of Iraq and Syria. The terrorists are engaged in crimes against humanity in areas under their control. They have terrorized and killed people of all communities, including Shias, Sunnis, Kurds, and Christians. This entry was posted in Europe, Middle East and tagged Charlie Hebdo, deadly attacks, France, French Muslims, IS, ISIS, Islamic State. Bookmark the permalink.